Magnificent Moon, by Ashleigh Young (Victoria University Press, 2012), 94pp. 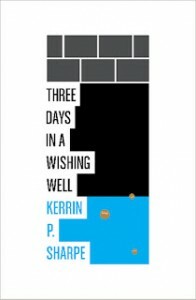 $28; Three Days in a Wishing Well,by Kerrin P. Sharpe (Victoria University Press, 2012), 71pp $25. In the weeks leading up to launch of Ashleigh Young’s first collection of poetry, Magnificent Moon, there was a widespread ripple of anticipation. Young is well known to New Zealand readers as her work has been published in magazines and journals (Best New Zealand Poems, Metro, Landfall, Sport, Hue & Cry) for the last decade. In 2009, Young won the Adam Prize for her Masters in Creative Writing (a collection of essays), as well as the Landfall Essay competition and the Macmillan Brown prize for writers. Music that has disappeared without trace. the salty windows of the cabin at Mokau. Although the poems contain ‘the ordinary world,’ in many ways they nod towards magic realism. In one poem her father sprouts from a vegetable bed, while in another her family materialize behind a series of doors. In many poems the world acts upon the poet: trapdoors spring open; the ground slaps her hands and knees rather than the other way around. The poet is jumbled and bewildered, and the surreal aspect of the book suggests a poet trying to understand her own life. The collection’s tone is also conversational and modern. Young has the rare skill of documenting everyday details— ‘chip packets and muesli’ in one poem—with a fresh eye. In a recent online conversation with Hera Lindsay Bird Young said: ‘I went through a phase years ago … of becoming infatuated with all of the 1950s and 60s American poets … A lot of those poets really changed how I thought about poetry. The idea that a poem could … commemorate the ordinary world in some way.’ This is an excellent description of what the collection achieves. Young’s style is purposeful, and the poems are beautifully crafted, especially in terms of pace, sound, and imagery. In the section about intimacy and adulthood, the poems inhabit other people’s lives: a woman watching an albatross, another woman feeling the loss of her daughter. They also explore her adult friendships with Jane, Simon, and Matthew, as well as the poet’s writing life, mental illness, homesickness, her work as an editor, and, of course, love. The modern world is the stage for these poems, and they are clearly influenced by art, current events, other writers, and social media. In saying this, few debut collections are without fault. A handful of the London poems possess a detachment that, for this reviewer at least, didn’t have the same heart as the rest of the collection. Although Young wants to ‘commemorate the ordinary’, don’t be fooled into thinking the poems rest there. Most of them subtly layer meanings in order to comment on the human experience. A theme that runs throughout the collection is the way we construct our own worlds. In the poem ‘Badly stuffed animals’, Young describes the sad and absurd image of a taxidermy fawn, which, placed at the base of a piano, appears to have a piano for a mother. On one level the poem describes the strange habits of people, but it also subtly critiques the way modern society is unable to accept death. In short, this is an unusual and fantastic collection. The poems are both vulnerable and restrained, as well as funny and modern. Of her writing Young stated (also in conversation with Hera Lindsay Bird): ‘I think an author has all sorts of responsibilities … To realise their work as fully as possible, as best they can.’ She has certainly done so with Magnificent Moon. Kerrin P. Sharpe’s collection Three Days in a Wishing Well may be the epitome of the phrase ‘it was a long time coming’. Sharpe—who lives and teaches in Christchurch—was one of the first graduates of the original Victoria University composition programme, taught by Bill Manhire in the late 1970s. Now that her children have left home, she has published an interesting debut collection. If the title is taken literally, each of the sections in the book represent a day spent at the bottom of a wishing well, with each of the poems a wish. It is easy to imagine the poet at the bottom of a well, and while waiting to be rescued her history and memories turn into wishes. The metaphor suits the the poems’ minimal punctuation, stream-of-consciousness tone, and short lines that, combined together, create dreamy vignettes. In the first section of Three days, Sharpe writes about history, war, and her mother the milliner and seamstress. It’s a reflective and personal window into New Zealand’s history. ‘Walking on wishbone’ with ‘the fruiterer / young ming and sons’ conjures street vendors, whereas ‘in memory of mary jane bennett’ pays tribute to New Zealand’s first woman lighthouse keeper. Sharpe’s close attention to detail—fishbone needles, gussets, the ‘old treadle sewing machine’ ,and her father’s fedora—evoke different periods in New Zealand history. Birds are present in most of Sharpe’s poems: blackbirds, thrush, sparrows, crows, and peacocks. Children turn into birds. Birds are made out of stitches. On the back cover of the book Bill Manhire likens the poems to ‘migratory birds’ that have ‘settled very briefly on the page’. It’s a good analogy. Not only do the poems feel airy and transient, but they explore the way words—and poetry—allow a reader to fly in their imagination. In ‘using air and wind’ Sharpe states: ‘flight is a word / full of wings’, which hints at the way Sharpe chooses words that are rich with meaning. While the heavy poeticism places her in danger of appearing cliché, because the language is part of an airy, dream-like narrative, the poems are interesting because of the contrast. While you can say certain poetry collections are ‘about’ something, it is difficult to find the literal thread in these poems. They dash off to unexpected places and can be read in many ways. Some readers may find this confusing or frustrating, but it’s the strength of the collection: the poems create a different wish for each person. SARAH JANE BARNETT is a poet and reviewer who lives in Wellington. Her first collection of poems A Man Runs Into A Woman, was published by Hue and Cry Press in 2012.